Given the addition of twins and my choice to stay home, most months find us juggling bills, making tough financial decisions and waiting for miraculous provision in one area or another. Recently we overspent in the beginning of the month, which made the end unbelievably tight, so I vowed to “get by” on what we have. This included, among other things, not buying tissues. Given the number of allergies in our house and the propensity for every cold within a five mile radius to tear its way through all six members of our household, this would prove to be no small feat. So we’re in the great tissue spending freeze and I’m pulling boxes from all around the house and vehicles as we slowly work our way toward a long awaited payday. We’re down to one box now and I’m hoping it’ll somehow multiply like the loaves and the fishes or the widow of Nain’s jars of flour and oil. This isn't the first time I've done this sort of thing - one time I decided to stop buying soap until we'd used up every last drop in the house, including the oatmeal bars we made ten years ago, the random gifts of body wash from my second baby shower, and the tiny bars of Dove snatched from the free samples basket at the pediatrician’s office. I told this to my husband as we drove home and I felt set free, delivered from envy, delivered from the lie that money brings happiness. While I was training to be a chaplain I learned to type up and analyze conversations from my visits with patients and their families. Part of the analysis involved noticing what myths the patient or chaplain were operating under during the conversation. It was often easy to tell which myths were driving the conversation, which ones ruled over the patient’s life with a watchful eye, delineating truth, establishing boundaries and taboos with unquestioned authority. We all have certain ideas that may or may not be true or helpful, yet somehow persist in shaping our view of ourselves and the way we ought to operate for things to go well in the world around us. Although many of the patients I spoke with, prayed with and sat with were in crisis situations, it was also clear that much of their personal emotional anguish came from their beliefs about the world. It may sound Pollyanna-ish, but attitudes and beliefs are often at the heart of our happiness and misery. The things we believe about ourselves and the world, especially those that migrate slowly, gaining speed, from our hearts to our mouths and out into the air around us, hold great power over our lives. God delivered me from the myth that money brings happiness, for awhile anyway. But recently, visiting friends again, I found myself slipping, judging those with more, lacking compassion for their deeply felt fears and anxieties because I felt that the fact that they had more than me should solve the problem. Internally I argued, reminding myself I’d been set free from the myth, but I could feel myself waffling, could feel my compassion and my own capacity for joy constricting. Then we came home. Home to our cramped quarters, littered with toys and socks, divided by wobbly gates to keep the twins safe, home to our emptying refrigerator, to our last box of tissues and I felt the tug of that old lie more fiercely yet. I pushed back on it, though, and tried to remain centered in the truth until the moment when my husband turned on our PC. The computer wouldn’t start, not in safe mode, not in regular mode, not in any mode. We ate dinner and got the kids to bed and ran a test that revealed the worst – the hard drive was shot, dying, dead. Then, oh my, did that old myth ever get loud. It rolled its way round and round in my thoughts gaining speed, gaining momentum, gaining power as I gave in to exhaustion and frustration. Everyone feels frustrated, overwhelmed, powerless when their computer crashes. Everyone feels like they ought to know more about it, ought to be able to, with money, control that which they cannot. It helped me to see that the way I was feeling wasn’t due to a lack of money, but rather a lack of control in my particular situation. I’m writing this because I don’t want to forget, don’t want to slip back into that old lie about money and happiness and I have a hunch I’m not the only one who’s fallen prey to it. For me, the disciplines of presence and thanksgiving play a large roll in helping me to remember and remain rooted in the happiness and beauty of the life I do have. 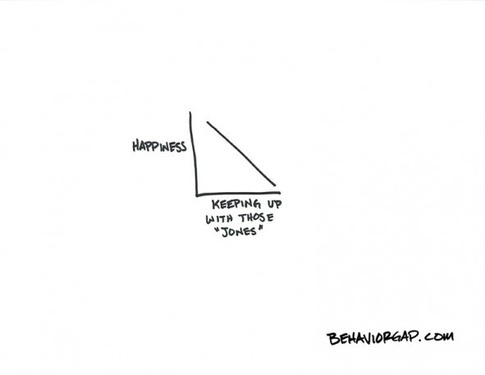 Do you find yourself giving in to the myth that money brings happiness? If so, how do you overcome it? Great Tissue Spending Freeze Update: Just the other day I got ten boxes of Kleenex "for cheap" at the local bent and dent store. I guess we'll really be living large now, blowing our noses whilly-nilly, without a second thought, just for the sheer fun of it. Crisis averted. "The things we believe about ourselves and the world, especially those that migrate slowly, gaining speed, from our hearts to our mouths and out into the air around us, hold great power over our lives." This is great. True. Challenging. Financial securities are so deeply rooted into our metrics of success, our culture, our issues of control, our weaknesses to the pervasive marketing vultures... it's difficult to step out and into a place of deeper security. Thanks for keeping this on the radar for all of us.